Angler Speed Ring for Paul C. Buff, Balcar, & Flashpoint Series 1 by Angler at Tobby News. MPN: 7464-PCB. Hurry! Limited time offer. Offer valid only while supplies last. Easily mount a Whitebox or Silverbox series softbox to a Paul C. Buff, Balcar, or Flashpoint Series 1 strobe with this Speed Ring from Angler. 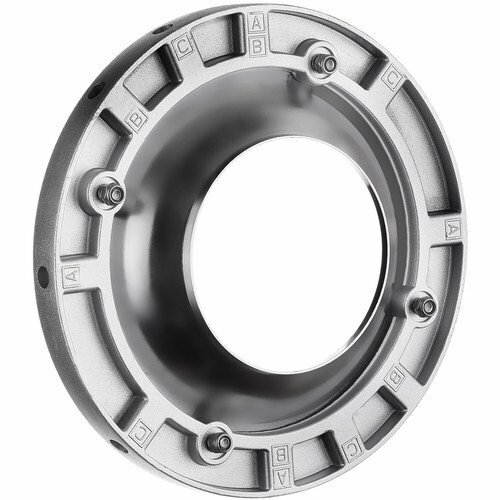 Easily mount a Whitebox or Silverbox series softbox to a Paul C. Buff, Balcar, or Flashpoint Series 1 strobe with this Speed Ring from Angler. Besides simply attaching the modifier, this aluminum ring has an outer rotating ring the enables the softbox to be rotated 360 degrees, which works with the self-locking feature to allow it to be quickly set up in any orientation that you need. Simplifying matters more are the indexed flex rod holes that visibly show you where to insert certain rods for compatibility with different types of softboxes. In addition to these capabilities, the outer rotating ring offers two 3/8"-16 female threaded receptors for using the speed ring on other products, such as a tripod or light stand. If you have any questions about this product by Angler, contact us by completing and submitting the form below. If you are looking for a specif part number, please include it with your message.